The colours of fall are some of the best things of the season. Between the yellows, red, greens and oranges, fall is one of the most beautiful seasons of them all. When the cooler weather comes, it’s time to start changing around your décor both indoors and outdoors. While redecorating can become expensive there are ways to decorate for the season without breaking the bank. In fact, there are several frugal outdoor fall decorating ideas that you can use to brighten up your outdoor space and prepare it for the season. Things like hay bales, pumpkins, gourds and cornstalks are all beautiful fall items. Use them as much as possible to accentuate your outdoor space. Clean out your summer planters and use them to display your fall décor. Things like chrysanthemums, large pumpkins or even winter pansies are perfect when it comes to repurposing your planters. Fall garlands are perfect for decorating planters, making your own front door wreath or even just for hanging around the front door frame. Garlands are rather inexpensive, especially if purchased at the dollarstore, or you can even make your own. In fact, while you are out collecting leaves, grab some pinecones too. You can make an amazing looking garland by hot gluing items to twine like pinecones, flower and leaves and more. To add a little more pizazz to your garland you can even paint the pinecones. Make sure you allow the garland to dry before hanging it over your door frames or around your hand railings. Make your own autumn door décor by repurposing items to construct a DIY wreath or seasonal décor. There are several autumn door décor ideas that are not only easy to put together, but also frugal. Hollow out a pumpkin and plant some seasonal flowers inside. 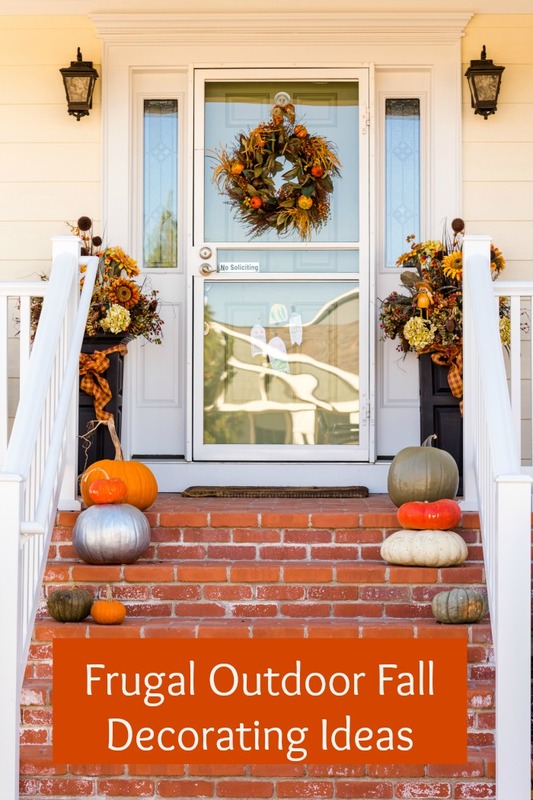 You will want to put some holes in the bottom of the pumpkin to allow for drainage, but this is a frugal and easy way to add some autumnal flare to your front porch. It’s as simple as filling it with dirt, planting your mums and keeping them watered. Hanging solar lanterns outside or placing them around your display is a fantastic way to add some fall flare to your outdoor décor. PRO TIP: Be sure to check out places like dollar stores, thrift shops, and your own backyard for some great seasonal items that will cost you next to nothing (or are free!). There are many frugal outdoor decoration ideas for fall that you can use this year. Just get creative and look for a few seasonal items that will add that pop to your front porch and yard. Find some budget friendly indoor autumn decor ideas here.